Posted by I've made this a couple times in the past, and love the versatility (and one pan sha-bang) of this Spanish traditional hearty and packed with flavors rice casserole. Now, for the purists out there.. stop reading. I don't have a nice paella pan (yet) though some of my girlfriends do... The first time I made this...it was -40C (and interestingly it converts to -40F! ), I was not about to tromp outside, build up a nice fragrant fire and attempt to barely warm the paella over it. If you do - take some pictures and let me know! But I made do with a deep non-stick pan and stovetop... and have time to relax while it simmers! On to the recipe! And finally, yes, please do splurge on the atrociously expensive saffron. Substitution with tumeric and other spices just doesn't cut it. Ante up and use the pricey saffron - its hand harvested flower parts that give this dish the wonderful flavor and yellow coloring, so there is a reason why its $20 for a few grams! 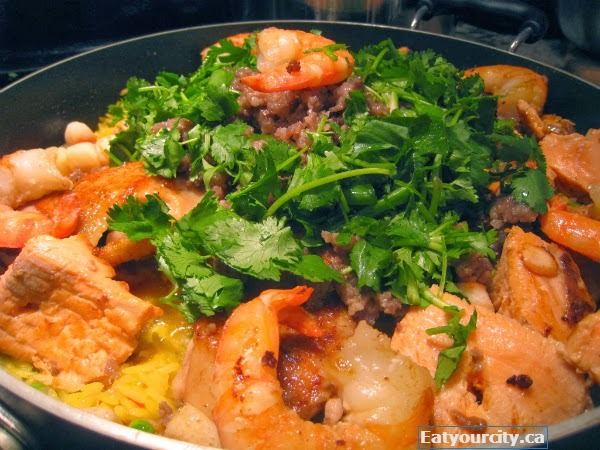 This paella version was made with fresh mussels, chorizo and basa fillets. So, as I mentioned earlier, this is a one pan recipe (yaaaah for those that hate washing dishes! ), and with washing of veges, chopping and prep time, this recipe takes from 30-45min total to put together... and this includes the 20min simmering time you can kick back with a glass of wine, beer or cuppa tea/java. Either serve it directly from the pan, or plated into bowls, this relatively quick recipe is super easy and a great dish for your family or entertaining. 1) In a deep skillet pan (this makes a lot! ), if using the sausage, brown over medium high heat, breaking it up with a wooden spoon into small bite sized pieces (or smaller if you like). Cook for 6-7 minutes until its thoroughly cooked through and no traces of pink remain. Drain oil from pan, reserving the sausage. 2) If no sausage was used, add olive oil to pan over medium high heat. Add in garlic, chili flakes, safron, bay leaf and stir for a minute or two until nice and fragrant. 4) Add in rice mix well, then add in broth and bring to a boil. 5) You can either add in your chicken, fish, scallops at this point, or cook them with a tsp of oil in another pan for chicken (6-7 min), fish (5min), scallops (3-4min) and add them in at the end. If using mussels, arrange on top of rice to steam. If using fried or firm tofu, push down into the broth. 6) Cover the pan, reduce heat to low and let simmer for 20minutes. Add fully cooked seafood/proteins on top if using, turn off heat and leaving the pan covered, let rest for an additional 10 min - this lets the rice absorb all the broth. 7. Relax with a beer, vino, coffee or tea while it simmers. Remove bay leaf, season to taste with salt and pepper. Garnish with chopped cilantro. Dig in!